I had a comment recently that remarked on how good the food must be in Cinque Terre, and we did, in fact, have a meal in Monterroso that was exceptional. Risotto a la Mare, complete with eyes and antennae. Dev said it was the best meal he’s had in a very long time, and once I picked the offending items out, I have to agree, it was delicious. We also had pasta one night, and pizza the other, so we covered the essential Italian fare in our first three nights. However, accommodation has cost us more than we anticipated, gas is ridiculous, and there are tolls everywhere (over 100 euros in tolls just getting to our first destination), so really, food is where we’ve been cutting corners. Our staple picnic fare has accidentally become breadsticks dipped in Nutella (which our youngest calls Nutzerella). And I say accidentally because our first day in Monterroso, I was charged with bringing lunch down to the beach and I couldn’t find anything suitable, so I went to the little store and bought the two items most easily recognizable (and some fruit). The kids said it was the best picnic ever, so it has become a bit of a standby. In fact, at the cafe here on the camp, if you don’t want to eat a raw ham sandwich (which they generally don’t), Nutella is pretty much the only other choice. 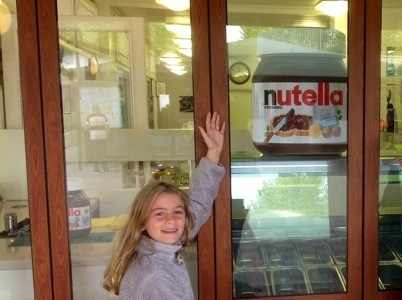 I remember a friend of mine travelling in Europe in her early twenties and blaming weight gain on Nutella. Now I can see why. It is everywhere, in very large quantities. And it’s cheap. And when you can’t understand the words on a package or menu because you did not learn enough Italian before you came to Italy, Nutella is a pretty safe option. Europe’s answer to PB & J.
I told you the tolls are crazy!! Oh well, no one ever died from Nutella. Did they?